There are seventeen (17) NES Feel Good Infoceuticals to choose from. Purchase all 17 Infoceuticals for $425.00 includes shipping and handling. You can purchase (1) Feel Good Infoceuticals for $35.00 (2--12) $30.00 each plus shipping and handling. Email Karen Khadijah Davis-Foulks your request by completing the form at the end of the page with your phone number. ARE YOU READY TO FEEL GOOD, LOOK GREAT AND SHARE THE LOVE? Your Personal energetic First-Aid Kit. Place your order today! NES Infoceuticals represent a quantum leap in helping you achieve optimum well-being. They are liquid energetic remedies 'imprinted' with bio-information. Infoceuticals address issues in your energetic system from the ground up, helping to correct blockages and imbalances that can affect your overall physical and emotional condition. An appropriate number of 'drops' helps return your body's energy flow to its perfect, natural state, where its own innate healing intelligence can do what it is designed to do. Your body's ability to heal itself is a miracle of nature. NES products encourage that miracle by helping activate your body's own healing systems. Infoceuticals are safe, effective and easy to use. NES Feel Good Infoceuticals are a special range of Infoceuticals designed for symptom-based home use, to be used alone or in conjunction with the NES Total WellNES system. Chill (ES-8) Chill encourages a calm mental state, and the releasing of emotional and sensory data. May be helpful when suffering from constant, long-term stress. EMF Electromagnetic Field helps correct energetic imbalances from radiation exposure. May help improve your ability to deflect electromagnetic fields. May be used topically on the hands, back of neck, or other exposed areas. ESR Emotional Stress Release supports the release of emotional stress, soothes the digestive tract, and may assist in the absorption of nutrients. May be applied topically to areas of physical trauma. Fat Metabolism helps to correct and normalize liver function, hormonal activity, and metabolism of fat. Supports the nervous system and may encourage appetite regulation. Female supports female endocrine function to enhance social abilities, attractiveness, sexual function, and charisma. Helps promote confidence, willpower, social warmth, and well-being. Heart Driver helps with decision-making processes, mental clarity and integration, identity and self esteem. Helps regulate emotions. May have a beneficial affect on skin tone and appearance. Heart Imprinter energetically enhances the heart's ability to imprint nervous system information onto the bloodstream. Helps re-establish the head-heart connection, promoting mental clarity and a positive emotional outlook. 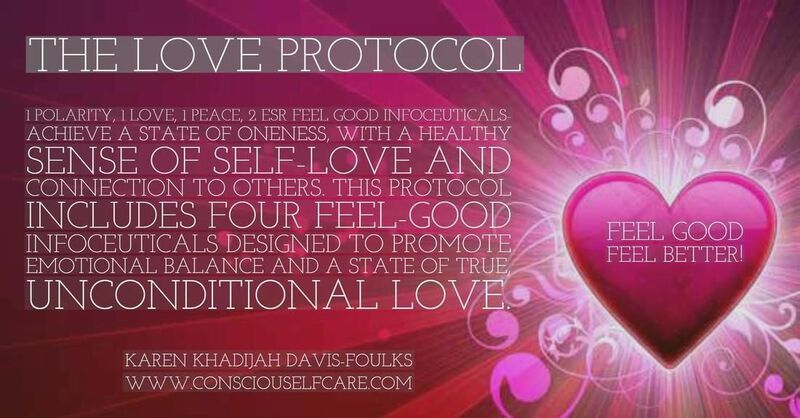 Love promotes feelings of unity and unconditional love for oneself and others. Supports personal transformation, and helps to clear the crown chakra. Male helps support the correct male endocrine function to enhance social abilities, attractiveness, sexual function, and charisma. Helps promote confidence, willpower, social warmth, and well being. Muscle Driver assists in clearing metabolic waste stored in muscle tissue to help restore flexibility, mobility, and muscle strength. Promotes independence and supports the ability to animate dreams and desires. Nerve Driver supports nervous system to help your body deal with stress. Helps to shed toxins, calm the system, and aid in your ability to get a restful sleep. Peace promotes a calm mental state, mental clarity, and honesty with oneself. Enhances the head-heart connection to resolve conflicts between emotions and logical thought, as well as memories that have caused disharmony. Polarity aids in correcting energetic distortions brought on by air travel, over-exposure to electromagnetic fields, chronic illness and geopathic stress. May assist in physical and emotional detoxification. Particularly useful for jet lag. Rejuvenation helps rejuvenate the body after sports, strenuous physical activity, physical injury, impact or shock. Aids in tissue regeneration, muscle recovery, muscle tone. May ease muscle strains, swelling, and trauma. May be applied topically in injured areas. Sleep promotes balanced sleep cycles and regulation of your body's natural rhythms. May have a harmonizing affect on the body's entire energetic system. Use 3-4 times throughout the day, with the last dose before bedtime to reset your sleep cycle. Source enhances source energy available for physical activity. May be useful when energetically depleted due to chronic illness, mental exhaustion, stress, toxic exposure, malnutrition, or poor breathing. Use before and during physical activity. The NES Feel Good Infoceuticals are safe and effective in restoring energetic coherence within the body-field. Dispense 9, 15, or 28 drops, as desired, into a glass of water or other beverage, and drink. May be taken with foods, nutritional supplements, medications, or while using other health programs or products. May also be applied topically to areas of pain.